My last post plotted party closeness for major religious groups in the UK, using data from the 2014 wave of Understanding Society. The chart blow plots party closeness for the major Christian denominations, along with party closeness for the general population. Respondents who did not specify a denomination were ignored. The most interesting result is that Anglicans (Church of England) are considerably more likely than the general population to support the Tories, whereas Catholics are considerably more likely to support Labour. Adherents to the Church of Scotland are somewhat less likely to support either party. 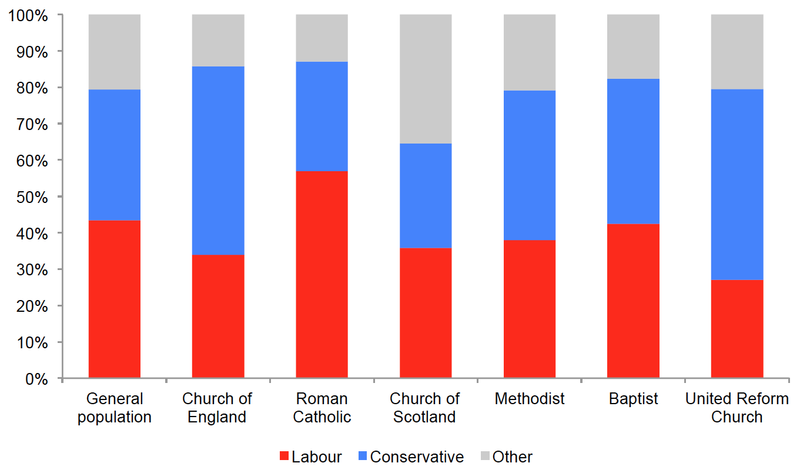 Methodists and Baptists are slightly more likely to support the Tories. 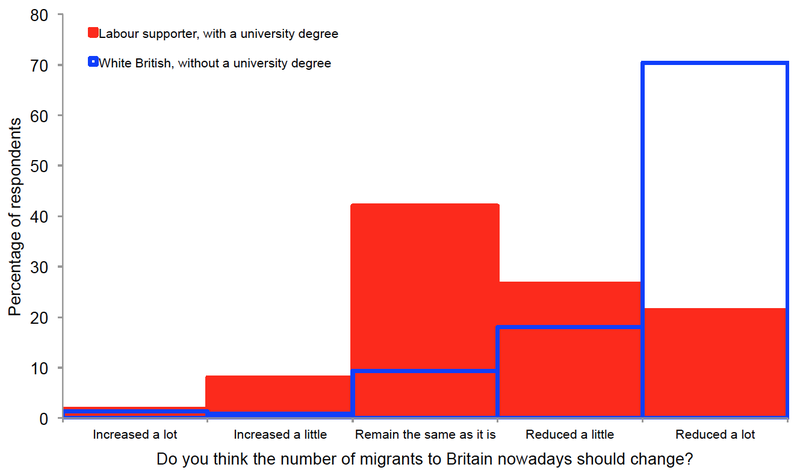 And adherents to the United Reform Church are much more likely to support the Tories (though n < 100 in this case). In the 2014 wave of Understanding Society, respondents were asked, "Which political party are you closest to?" The chart below plots the distribution of responses across Labour, the Conservatives and other parties, separately for the general population and each major religious group. It should be noted that, although I applied sampling weights, the percentages are probably slightly off. In this sample, 43% are closest to Labour, and only 36% are closest to the Tories, whereas in the last General Election, the Tories won 37% of the vote and Labour only 30%. It should also be noted that the sample sizes for Buddhists and Jews are very low (n < 100). Nevertheless, it is instructive to examine the differences between the various religious groups. Christians and Jews are slightly more likely than the general population to support the Tories. Buddhists are slightly less likely to support Labour, and much less likely to support the Tories. Hindus are somewhat more likely to support Labour. And Muslims and Sikhs are massively more likely to support Labour. A full 83% of Muslims and 86% of Sikhs say they are closest to Labour, which is 40+ percentage points higher than the fraction in the general population. One important caveat is that some recent surveys have suggested that Tory support among Hindus and Sikhs increased appreciably at the last election. There is a large and rich empirical literature dealing with the impact of immigration on native wages. Many commentators have concluded on the basis of this literature that immigration exerts little or no effect. This post asserts, to the contrary, that immigration often does in fact lower native wages. It qualifies the argument by pointing to circumstances where one would not expect immigration to have negative wage effects. In a simple supply-and-demand model, immigration pushes the labour supply curve to the right, leading to a decline in the equilibrium wage; competition for jobs increases, so wages get bid down. There are two main reasons why this inference could be unsound. First, labour demand might be extremely elastic. Yet this seems rather implausible to me, as I will proceed to argue. Second, immigration might simultaneously increase both labour supply and labour demand. Immigrants not only buy goods and services, thereby indirectly contributing to labour demand, but also start businesses of their own. For example, the tech giants Google, Ebay and Yahoo were all founded by immigrants. However, notwithstanding much pontificating on the subject, immigrants are not a single, homogeneous mass; some are more entrepreneurial than others. On average, high-skilled immigrants will be more likely to start businesses, while low-skilled immigrants will be more likely to compete in the labour market. 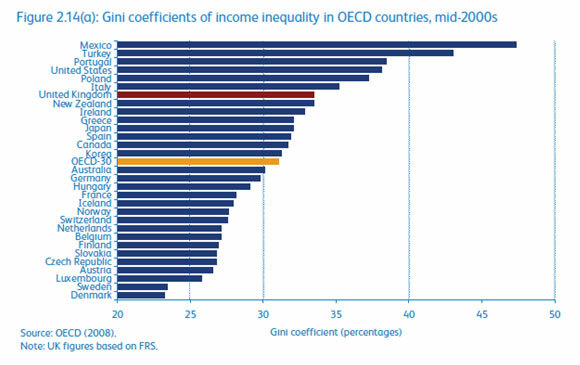 All else being equal, there is some percentile of the skill distribution below which the average immigrant will increase labour supply more than labour demand. In addition, the more barriers to entry there are in an economy, the greater the advantage to incumbents, and the less likely immigrants will be to grow successful businesses. Having mentioned migrant heterogeneity then, the rest of this post will focus on low-skilled (non-entrepreneurial) immigration, arguing that it often does lower the equilibrium wage. The literature dealing with the impact of immigration on native wages is plagued by at least three important methodological issues. First, immigrants frequently settle in areas where labour demand is high or rising. Under such circumstances, the negative effect of immigration on wages may be misidentified due to the endogeneity of labour supply and labour demand. Second, immigration into an area may cause natives to relocate elsewhere, thereby leaving total labour supply unchanged. And third, immigration may have opposing effects on wages at different points in the earnings distribution. For example, shareholders and executives may be able to pay themselves more when labour costs are lower, owing to higher profit margins. A seminal paper dealing with the impact of immigration on native wages is David Card’s study of the 1980 Mariel Boatlift, when Fidel Castro unexpectedly permitted more than 100,000 Cubans to emigrate to the United States over a six month period. Famously, “the Mariel influx appears to have had virtually no effect on the wages or unemployment rates of less-skilled workers, even among Cubans who had immigrated earlier.” However, George Borjas recently re-analysed the impact of the Mariel Boatlift, and found that, “The absolute wage of high school dropouts in Miami dropped dramatically, as did the wage of high school dropouts relative to that of either high school graduates or college graduates.” In another working paper, Sir Stephen Nickell and Jumana Saleheen examined the consequences of British immigration, taking care to partition their sample into different occupational groups. They observed “a significant, small, negative impact on average wages”, yet “closer examination reveals that the biggest impact is in the semi/unskilled services sector.” In 2008, the House of Lords commissioned a report on the economic impact of immigration, which garnered opinions and expertise from a number of leading researchers. According to the report, “Most of our witnesses agreed that there is some negative effect of immigration on the wages of low-skilled workers”. It does add, however, that “there were disagreements over the extent of the effects and the amount of evidence”. Of course, as the qualification in the House of Lords report makes clear, some scholars continue to read the econometric evidence as implying that any downward pressure on wages due to immigration is negligible. However, statistical studies in which one attempts to identify the causal impact of immigration on wages are not the only kind of evidence that can be brought to bear on the present question. There are several kinds of circumstantial evidence, which––taken alongside the statistical studies––constitute a fairly compelling case that low-skilled immigration really does depress native wages. The first kind of evidence comes from the effects of changes in labour supply for reasons other than immigration. 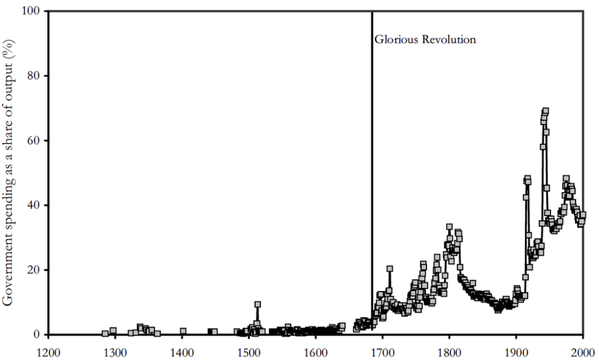 Economic historians have documented a marked rise in labourers’ real wages following the scourge of the Black Death, which dramatically reduced the size of the European workforce. 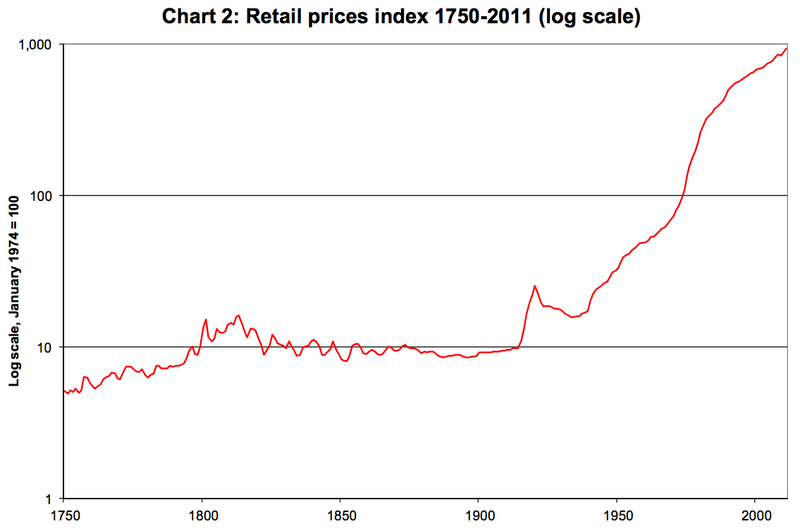 In fact, wages increased so rapidly that controls were implemented by a number of West European states. Though somewhat more tentative, according to several US studies, the mass-entry of women into the labour force during the second half of the 20th century depressed wages at the low end of the skill distribution, particularly among men. In both these cases, a plausibly exogenous change in labour supply influenced wages in exactly the manner predicted by the simple supply-and-demand model outlined above. The second kind of evidence comes from public opinion. 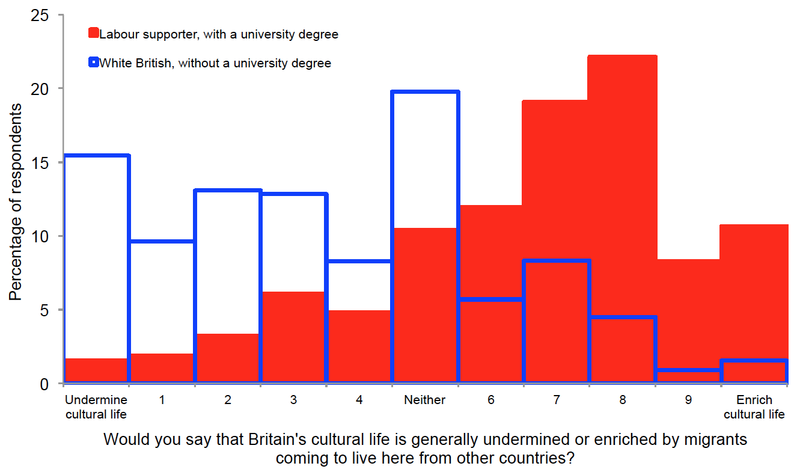 Polls consistently show that native whites in the lowest social classes are the least sanguine about immigration. 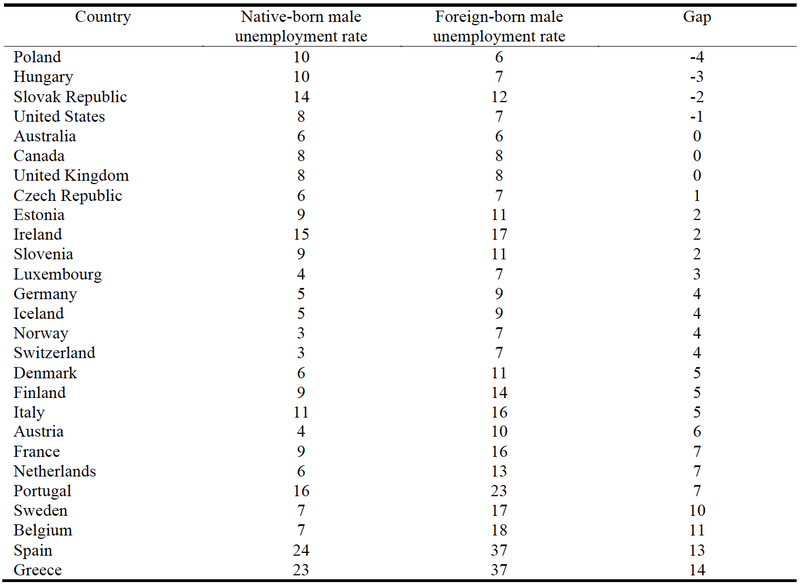 Moreover, such individuals are not uniformly opposed to all categories of immigration: they are much more hostile to low-skilled immigration than to high-skilled immigration. This suggests that their opposition is at least partly motivated by economic concerns, rather than solely by attachment to national culture or xenophobic prejudice. 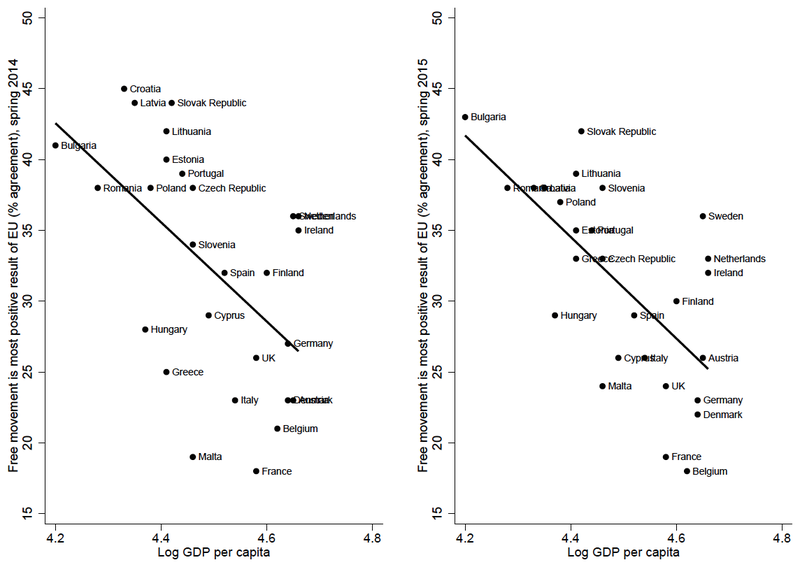 In addition, Europeans living in EU member states are noticeably more favourable toward richer non-EU countries joining the EU (e.g., Switzerland) they are toward poorer non-EU countries joining (e.g., Macedonia). The third kind of evidence comes from the political activities of professionals and big businesses. If demand for labour were extremely elastic, there would be little incentive for practitioners to restrict entry into their profession through occupational licensure. In reality, a diverse array of professions have managed to get legislation passed requiring new entrants to pay extortionate fees, sit time-consuming exams, or jump through pointless bureaucratic hoops. Such measures serve to reduce the total supply of practitioners, the better to bolster the wages of incumbents. In the US, it is not merely doctors who must have a licence in order to practice, but also auctioneers, massage therapists, hair braiders, and even hypnotists. Furthermore, if demand for labour were extremely elastic, there would be little reason for big business to lobby for higher levels of immigration. Yet in reality, the Chamber of Commerce and the Confederation of British Industry––the primary big business lobbies in the US and UK respectively––consistently press their governments to let in more immigrant workers. Indeed, the infamous Koch brothers are staunchly in favour of higher immigration––a stance that has not won them many friends within the conservative ranks of the Republican Party. The railway to California was built by the bourgeoisie awarding itself through Congress an enormous mass of ‘public land’, that is to say, expropriating it from the workers; by importing Chinese rabble to depress wages; and finally by instituting a new off-shoot, the ‘financial aristocracy’. In conclusion, whilst immigration is capable of increasing both labour supply and labour demand, low-skilled immigration tends to increase labour supply more than labour demand, which has the effect of lowering workers’ equilibrium wage. Evidence for this mechanism can be found not just in econometric analyses of immigration, but also in changes in labour supply for reasons other than immigration, in public opinion, in the political activities of professionals and big businesses, and in statements made by prominent members of the old left. My last post inspired a number of requests for a multiple regression analysis with potential suppressor variables included. The table below shows standardised coefficients from OLS models of the state murder rate. In addition to population density (which was requested twice), Southern state, fraction in poverty, and fraction black were selected as covariates, due to their well-documented associations with the frequency of homicide in the US. These variables were all taken from the US Census Bureau. The estimate for gun ownership is quite unstable across the different models, ranging from marginally significant and positive to significant and negative. In the final model, which explains just under 70% of the variance in state murder rate, gun ownership has a negative estimate; both fraction in poverty and fraction black have positive estimates. If anyone wants to play around with the data, I'd be happy to share them. Or else they can be retrieved through the various links provided. The chart below plots estimates of gun ownership against the murder rate for EU countries (red) and US states (blue). 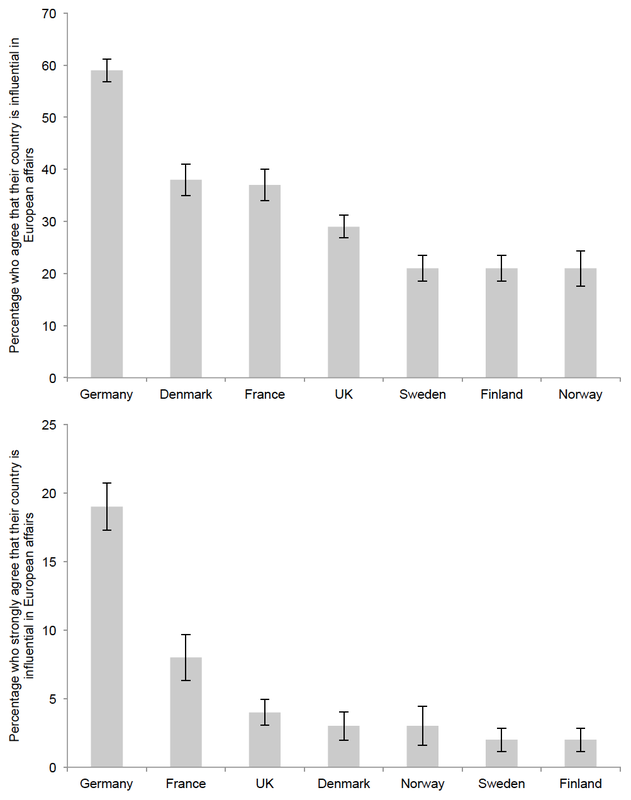 Estimates of gun ownership for EU countries were taken from the 2007 Small Arms Survey. 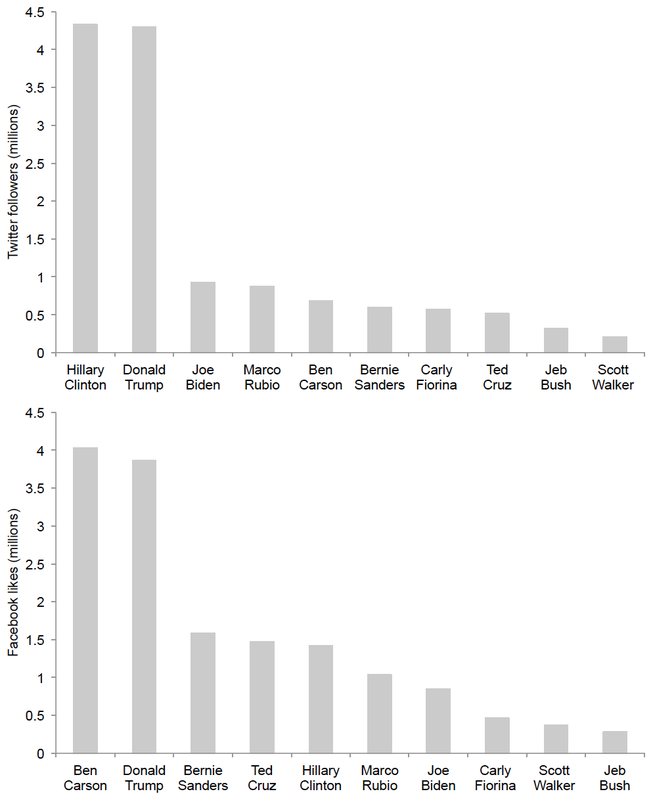 Estimates of gun ownership for US states were taken from a paper by Okoro et al. (2005; Pediatrics). Because Okoro et al. 's figures are from 2002 (when gun ownership was lower), and correspond to household ownership rather than simply guns per capita, I (conservatively) added 20 to each state's estimate. I say "conservatively" because this still only brings up the average gun ownership to ~60 per 100 people, whereas the Small Arms Survey estimated ownership at 89 per 100 people in 2007. Homicide figures for EU countries were taken from Eurostat, while those for the US were taken from the FBI. Figures were averaged over the years 2008-2010 to obviate sampling error in small states with few murders. Overall, the murder rate is much higher in the US than in the EU. However, within each continent there is no clear association between gun ownership and the murder rate. Some US states are armed to the teeth (e.g., North Dakota, Idaho, Utah and Iowa), but have murder rates on a par with countries such as Ireland, Belgium and Cyprus. By contrast, other US states are not especially well-armed (e.g., New Jersey, New York, California and Maryland), but have murder rates considerably higher than nearly all EU countries. Interestingly, the four EU countries with the highest murder rates are concentrated in the North East, next to Russia. There’s been much talk recently — including from President Obama — about there being a substantial correlation between state-level gun death rates and state gun laws. Now correlation obviously doesn’t equal causation; there may be lots of other factors that are the true causes of both of the things that are being measured. But if we do look for now at correlation, it seems to me that the key question should focus on state total homicide rates, or perhaps (for reasons I describe below) total intentional homicide plus accidental gun death rates. 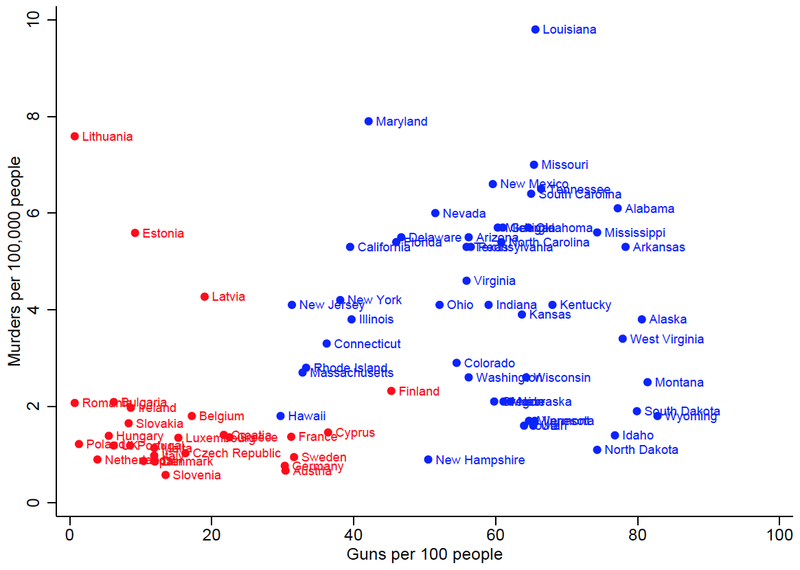 And it turns out that there is essentially zero correlation between these numbers and state gun laws. He argues, as I also would, that the appropriate measure of homicide is not murders committed with guns per capita, but simply murders per capita. The main reason being that, in the absence of guns, individuals presumably select into other methods of killing, such as knives or clubs. Has fracking contributed to the decline in US carbon emissions? 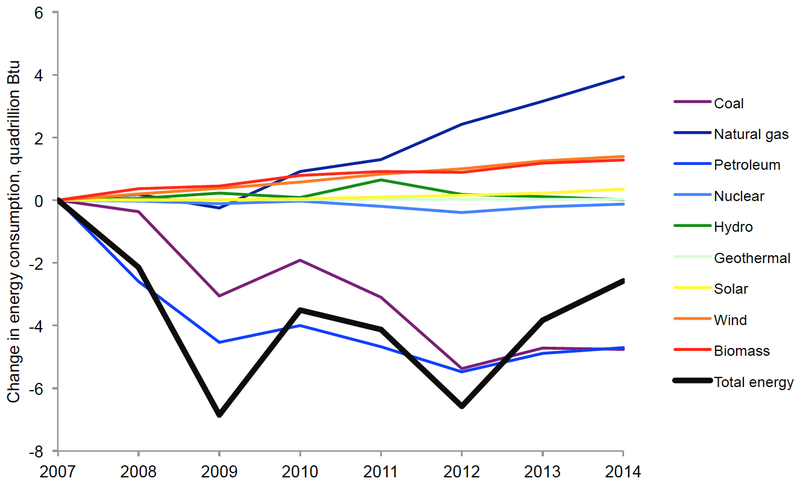 Before 2007, rising emissions were primarily driven by economic growth. After 2007, decreasing emissions were largely a result of economic recession with changes in fuel mix (for example, substitution of natural gas for coal) playing a comparatively minor role. (I say "seems", because on p. 4 they claim that "about half of the 2.1% decrease in emissions during 2011–2013 is related to changes in the fuel mix of the energy sector"). Incidentally, the reason why exploitation of shale could plausibly have contributed to a decline in US carbon emissions is that natural gas has much lower emissions per unit of energy than other fossil fuels, particularly coal. In any case, I decided to conduct my own, simpler analysis using data from the Energy Information Administration. The chart below plots absolute change in energy consumption from different sources, along with absolute change in total energy consumption, for the period 2007-2014. Since 2007, there has been: a fall in total energy consumption, followed by a partial recovery since 2012; a protracted fall in consumption of coal and petroleum; a rise in consumption of natural gas since 2009; a smaller rise in consumption of wind and biomass; and little change in consumption of hydro, geothermal and solar. In fact, coal consumption has fallen by 4.8 quadrillion Btu, while natural gas consumption has risen by 3.9 quadrillion Btu. In order to examine how much the exploitation of shale gas (i.e., the rise in natural gas consumption) has contributed to the decline in US carbon emissions, I reconstructed changes in carbon emissions since 2007 under the assumption that there had been zero substitution of coal for natural gas. In other words, I assumed that natural gas consumption had remained constant, and that all the increase in energy consumption from natural gas (3.9 quadrillion Btu) had actually come from coal. To calculate carbon emissions in each year, I multiplied the quantity of energy consumed from each source by that source's life-cycle carbon emissions (taken from the IPCC), and then summed over all the sources. The chart below plots three series for total carbon emissions: actual emissions (taken from the EPA); reconstructed emissions; and reconstructed emissions, without shale gas (i.e., under the assumption of zero substitution). 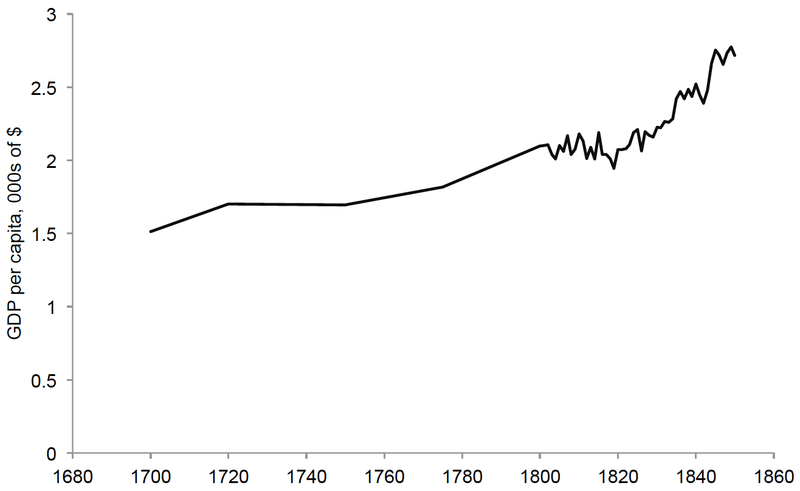 All three lines have a very similar profile to the thick black line for total energy consumption in the chart above, consistent with the Nature Comm. paper's finding: most of the decline in carbon emissions has been due to a fall in energy consumption caused by the recession. 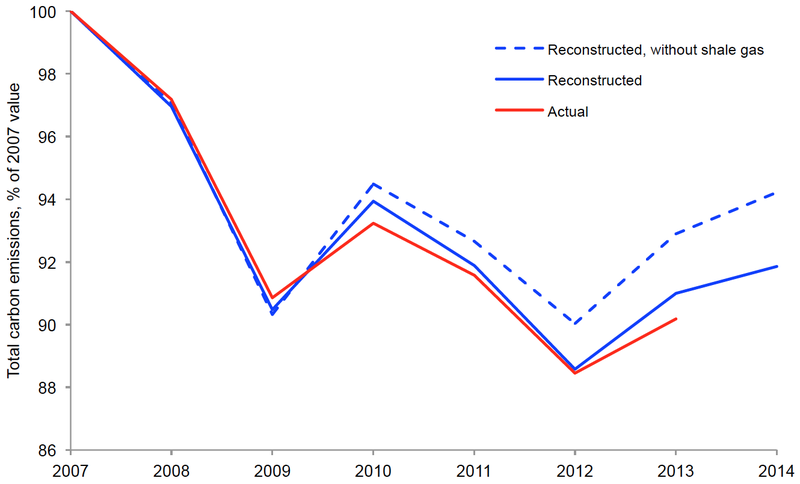 Comparison of the non-dashed blue and red lines reveals a remarkably good fit between actual emissions and reconstructed emissions (r = .99). Comparison of the non-dashed and dashed blue lines indicates that emissions are appreciably lower than they would have been if there hadn't been any rise in natural gas consumption. In fact, exploitation of shale gas accounts for just under a third (29%) of the difference in total carbon emissions between 2007 and 2014. My reading of the evidence here is that most of the decline in US carbon emissions since 2007 is indeed attributable to a decline in total energy consumption caused by the recession, but that just under a third of it is due to exploitation of shale gas from fracking. As noted, I am well outside my area of expertise, so I would be interested to know if anyone with a better understanding of the area has any comments or criticisms. "All of us working with Jean Monnet well understood how irrational it was to carve a limited economic sector out of the jurisdiction of national governments and subject that sector to the sovereign control of supranational institutions. Yet, with his usual perspicacity, Monnet recognized that the very irrationality of this scheme might provide the pressure to achieve exactly what he wanted - the triggering of a chain reaction. The awkwardness and complexity resulting from the singling out of coal and steel would drive member governments to accept the idea of pooling other production as well"
"The internal market and the common currency demand joint co-ordinating action. This will require us to finally bury some erroneous ideas of national sovereignty... National sovereignty in foreign and security policy will soon prove itself to be a product of the imagination." "Monetary union is there, the common currency is there. So our main concern nowadays is foreign policy and defence. The next step, in terms of integration of the European Union, will be our constitution. We are today where you were in Philadelphia in 1787." "We know that nine out of ten people will not have read the Constitution and will vote on the basis of what politicians and journalists say. More than that, if the answer is No, the vote will probably have to be done again, because it absolutely has to be Yes." "The EU Constitution is the birth certificate of the United States of Europe. The Constitution is not the end point of integration, but the framework for––as it says in the preamble––an ever closer union." "If it's a Yes, we will say "on we go", and if it's a No we will say "we continue"." "Of course there will be transfers of sovereignty. But would I be intelligent to draw the attention of public opinion to this fact?" "I like to compare the EU as a creation to the organisation of empire. We have the dimension of empire." "If governments were always right we would not have the situation that we have today. Decisions taken by the most democratic institutions in the world are very often wrong." "Monetary policy is a serious issue. We should discuss this in secret, in the Eurogroup… I'm ready to be insulted as being insufficiently democratic, but I want to be serious… I am for secret, dark debates... When it becomes serious, you have to lie." "We decided to arrive at a political union via an economic and currency union. We had the hope––and we still have it today––that the Euro will gradually bring about political union... Most member states are not yet fully prepared to accept the necessary constraints on national sovereignty. But trust me, the problem can be solved." "We need a political union, which means we must gradually cede powers to Europe and give Europe control... We cannot just stop because one or other doesn’t want to join in yet." "There can be no democratic choice against the European treaties." "It's a horrible path, but it's a logical path. Leave Europe, leave Schengen and leave democracy. Do you really want to participate in a common state? That's the question." "The coming weeks will show that the development of the markets, government bonds and the economy of Italy will be so far-reaching that this will be a possible signal to voters not to vote for populists on the right or left"
"The worst case scenario would be Italy goes bankrupt. Then the Troika would have to march into Rome and take over the finance ministry"
According to the Chronicle of Higher Education, the average full professor at Harvard makes $205,506 a year. According to the Bureau of Labor Statistics (Table 1), the average chief executive makes $180,700 a year. So Harvard professors apparently make $25,000 a year more than CEOs. In fact, according to the Chronicle data, full professors at the top twelve highest-paying colleges all make more than $180,700 a year. Of course, the distribution of CEO pay is likely far more skewed than the distribution of college professor pay, meaning that the highest-paid CEOs earn disproportionately more than the rest. YouGov recently carried out a poll on the upcoming EU referendum in which respondents were asked to identify with one of the following four positions (unless they had not yet formed an opinion): "strongly in", "leaning in", "leaning out" or "strongly out". Respondents were then asked to give the names of politicians they liked, which allowed YouGov to compile a list of the most well-liked politicians among respondents in each of the four groups (shown below). All the most well-liked politicians in the "strongly in" group are, with the exception of the speaker John Bercow, from Labour, the Greens or the SNP; by contrast, all the most well-liked politicians in the "strongly out" group are from the Tories or UKIP. 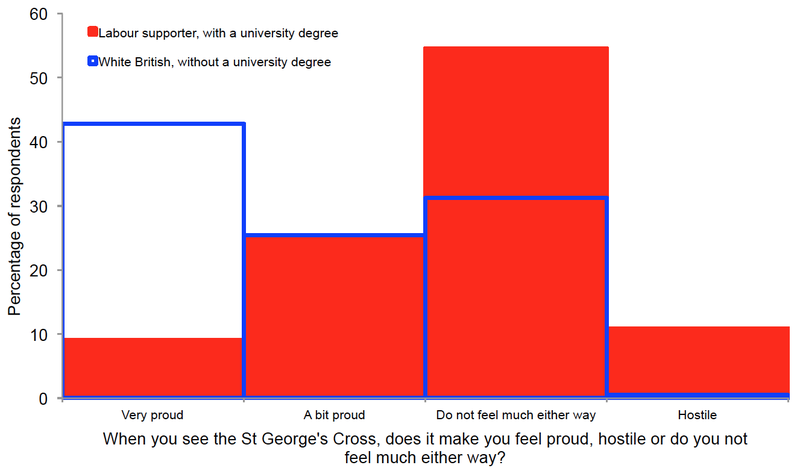 Whilst these results fit with the conventional wisdom that those on the left are less nationalistic and more supportive of immigration, it is not entirely unremarkable that Caroline Lucas––the only MP from the most left-wing environmentalist party in Europe––should be the most well-liked politician among Brits who identify with "strongly in". After all, such "neoliberal" newspapers as The Financial Times and The Economist have editorialised in favour of staying in; big businesses generally favour staying in (while small businesses generally favour getting out); large investment banks, such as Goldman Sachs, have argued in favour of staying in (though some hedge funds would reportedly prefer to leave); and many of the EU's strongest proponents, such as Ken Clarke, Michael Heseltine, and the late Ted Heath, have come from the Conservative Party. Consistent with the notion that there is a left-wing strain of euroscepticisim in the UK as well as a right-wing one, I identified all the following leftist individuals and organisations as being either somewhat or very eurosceptic: the late Michael Foot, the late Tony Benn, the late Bob Crow, Lord Glasman, Alan Sked, Costas Lapavistas, Mark Wallace, Mehdi Hasan, John King, Kate Hoey, Owen Jones, John Gray, Scott Dickinson, Chris Bambery, the RMT, the AGS, the Communist Party, the Socialist Party, the Liberal Party, Socialist Resistance, and Solidarity. 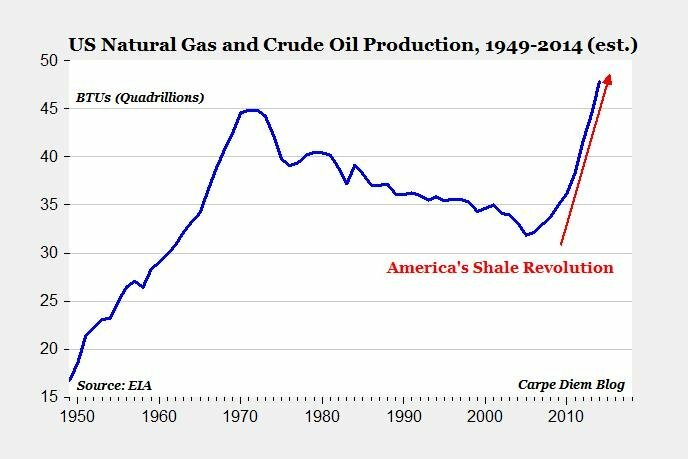 As I've noted in several previous posts, the US fracking industry has grown precipitously in the last decade or so. Oil and gas production has increased by about 50% since 2005. The US is now the world's largest gas producer, and third largest oil producer. Using data on real output (calculated as gross value added) from the Bureau of Economic Analysis, the chart below plots the change in output from oil and gas along with change in output from all other sources. 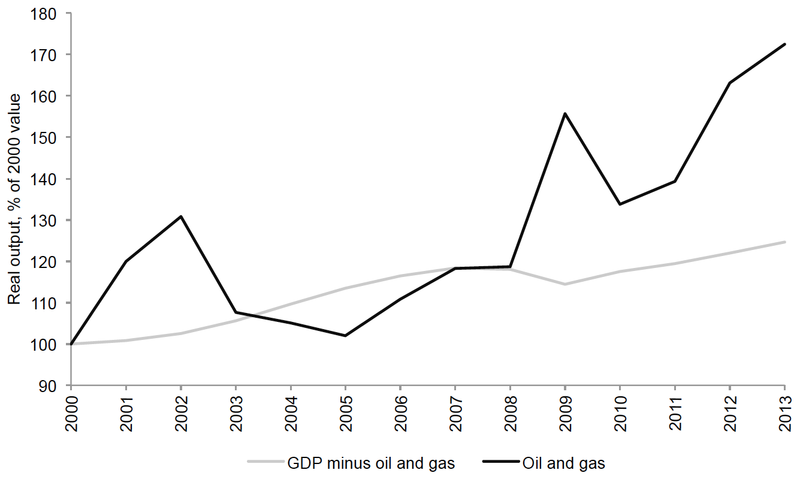 From 2000 to 2013, oil and gas output rose by 72%, while output from all other sources rose by only 25%. Using the same figures, it is possible to estimate how much of the growth in real output under both President Bush and President Obama was attributable to growth in the oil and gas industry. Between 2000 and 2007 (the year before Bush entered office to the year of peak output) oil and gas accounted for ~1% of growth in real output. By contrast, between 2008 and 2013 (the year before Obama entered office to the latest available year) oil and gas accounted for ~7% of growth in real output. 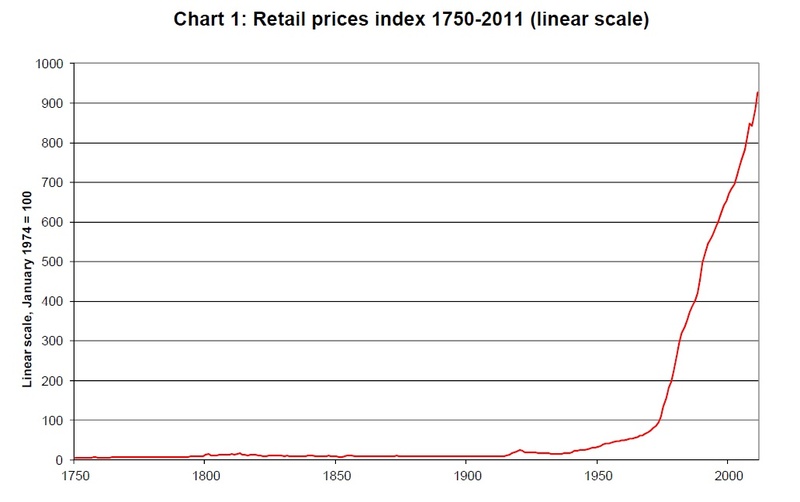 Indeed in 2013, oil and gas represented 1.7% of gross domestic product––the highest value since 1984.